Modern clubhouse with bar. Pro shop with equipment hire. Golf Practice facilites including driving range. Clubs and trolleys are available for hire from the golf club and there is a Pro Shop if you need to stock up. The course is situated in a valley between two hills. The attractive setting with wide greens, lakes, streams and obstacles, make play extremely enjoyable and suitable for players of all levels. 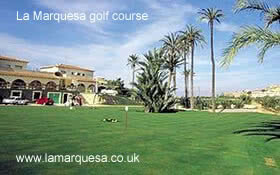 La Marquesa, some people say is an easy course, a course to get yourself ready for the more demanding courses in the area! Believe me this is not the case. Since the course was upgraded bringing more water into play, accurate tee shots are required, and with quick greens, well placed bunkers and the longest par five on the Costa Blanca, judge for yourself!